Hi! I'm Mei and I'm living the Aussie Beautiful life! 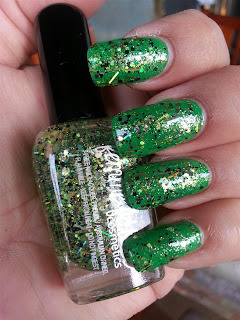 I love everything cosmetics, hair, nails and all things shiny. I am extremely lucky to be working in the cosmetics industry so this is just my daily raving on all the fantastic (and not so fantastic) products I've come across over the years and the new ones I find. So grab your cuppa or glass of wine and have a good look around! I love getting home from work and being greeted with nail mail treats!! 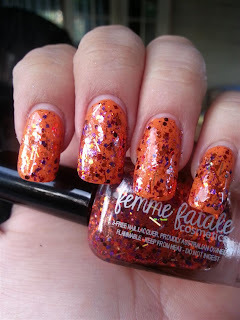 Today's delivery was Femme Fatale Cosmetics new Halloween Trio. I'm going to be lazy and steal the descriptions directly from FF website simply because these polishes have so much going on I don't want to miss anything. First up is Ghoulish Glee, this is jam packed with amazing. 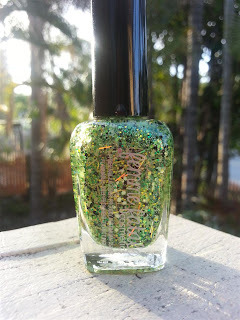 A green jelly base with holographic gold bars, holographic lime hexes, black squares, moss green hexes, light green hexes, green squares in metallic/matte, tiny neon yellow and chartreuse glitters – and more. I wanted to stick with the ghoulish green theme, so this is one thick coat layered over Ulta3 Frog Prince. Next up is Sinister Calling. 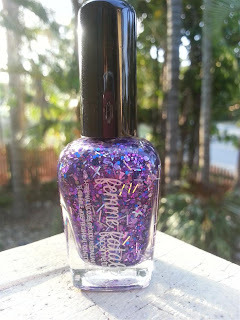 Personally I think it's too pretty for its name and it is by far the prettiest purple glitter I own. It has a purple jelly base with holographic purple shreds, navy blue shreds and hexes, holographic silver bars and stars, colour-shifting shimmer (blue to purple), tiny deep blue glitter, various purple glitter in different shapes and sizes. This is one thick coat layered over Ulta3 Violet Rumble. And I've saved the best for last. Tricky Treats is my personal favourite of the three. My photos do not do it justice at all. It is one of the prettiest polishes I own, hands down. 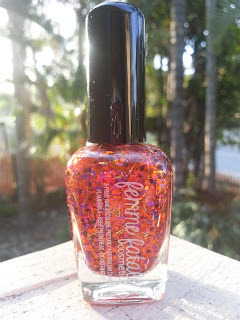 It has a slight orange jelly base and pink hexes, holographic pink hexes, holographic gold bars, red and purple squares, tangerine hearts, and subtle amount of fine copper shimmer. This is one thick coat layered over Maxfactor Satsuma (really awesome pumpkin orange colour). 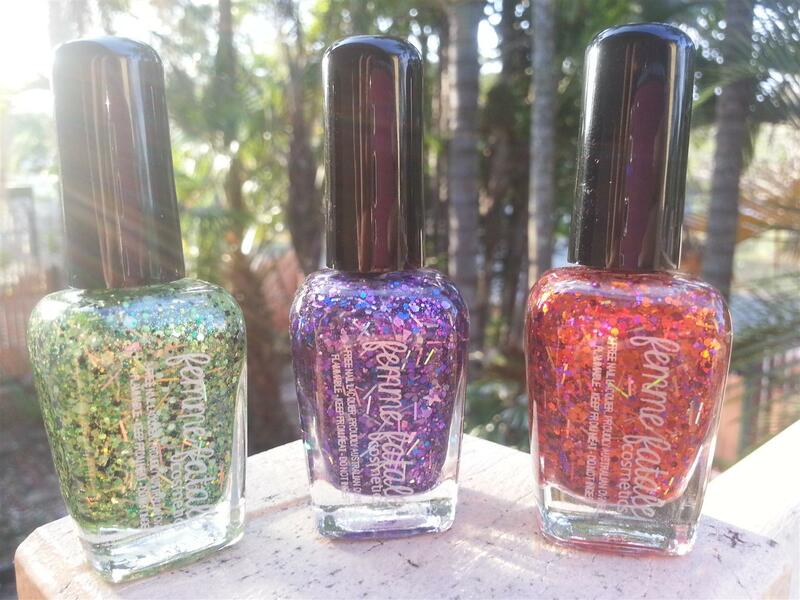 Application on all 3 was easy, glitter applied smoothly and was not gluggy or thick at all. Drying time was impressive considering I applied quite thick coats. All Femme Fatale polishes are available in 5ml mini bottles ($4) and full size 13ml bottles ($10.50). 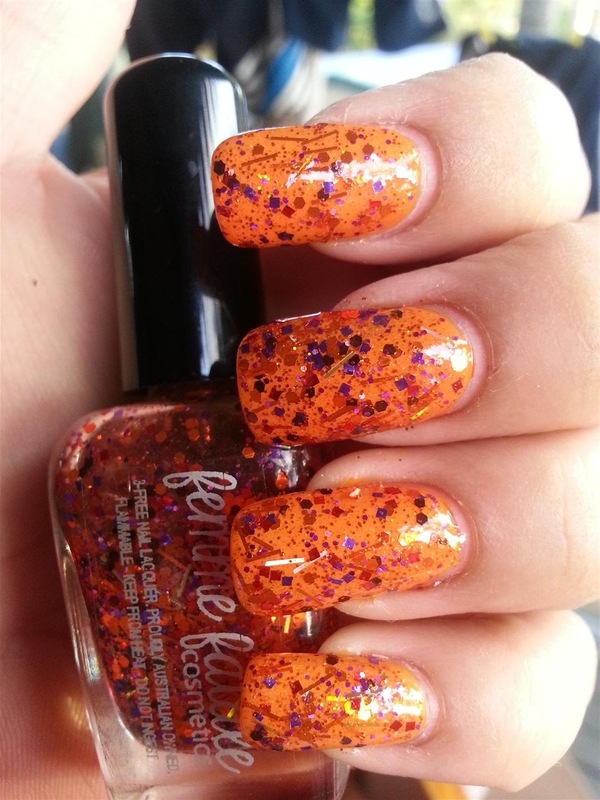 You really need to get your hands on these polishes, they're a must have and not just for Halloween! !